"Ransomware"- No worries for Connect Broadband Customers. Chandigarh, May 17, 2017: The ransomware popularly known as WannaCry is already a global phenomenon. Within just a few hours, the malware infected well over 200,000 computers globally and over 48,000 ransomware attack attempts have been detected in India. As per reports 60 per cent of attempts by the malicious WannaCry ransomware were targeted at enterprises, while 40 per cent were on individual customers. There are many businesses and Individuals who avoid upgrading their computer security. But the unusual rise of ransomware attacks means it's time for them to update their security protocols. 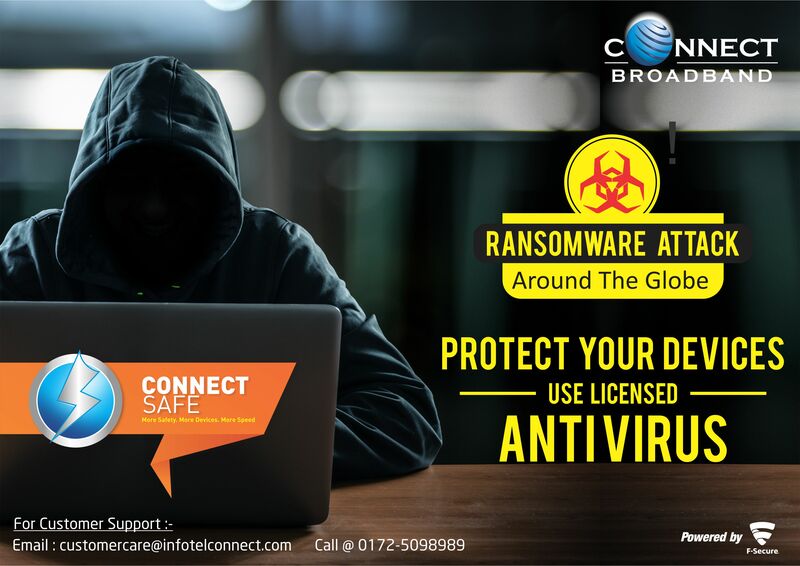 During this time of international crisis, Connect Broadband assures its customers full security by offering them a world class anti-virus product called Connect Safe, the latest international virus control program for multiple devices. The product has been designed to respond to the security needs of multi-device households. Connect Safe provides complete protection for safe shopping and banking experience, privacy protection, tracking for lost devices, device security and much more. Connect Safe is the only antivirus system which has been able to handle this attack. In fact Connect safe detected the ransomware since its inception, meaning that the protection was made available to all the Connect broadband customers already before the outbreak. Developed by Finland based F-Secure Corporation, the product has been introduced by all the leading European telecom operators and is a raging success in all the European and Latin American markets. Speaking from Barcelona, Mr Arvind Bali, CEO, Connect Broadband "We are here to represent Connect Broadband at SPECIES'17, and I am happy to send this message for Connect SAFE users that their precious data is safe and cannot be impacted by any ransomware. The product blocks hackers to maintain privacy of data, safeguards the Internet for children - on PCs, tablets, MAC, IOS and android phones thereby reducing service interruptions and security hassles. We continuously strive to give our users the best of technology and security systems." CONNECT is a pan India ISP Licensee with market leadership in Punjab Telecom Circle, which consists of Punjab, the Union Territory of Chandigarh and Panchkula. The Company also provides a full gamut of telecommunication services, which includes voice telephony, both Wireline and fixed wireless, Internet services, broadband data services and a range of value added service viz., Centrex, leased lines, voice mail and video conferencing. Connect has recently expanded its coverage footprint with launch of data services in Haryana and Himachal Pradesh. What more? CONNECT also provides Wireless Broadband service across Punjab. Offering high speed internet through a wireless medium, CONNECT Wireless Broadband enables users to access internet through their Laptops, PCs, Tablets, Wi-Fi enabled phones in the wireless vicinity & FTTH which is a Broadband telecommunications system based on fiber-optic cables and associated optical electronics. The technology reaches the boundary of the living space, such as a box on the outside wall of a home. Quadruple play of high-speed broadband, high-definition video, unlimited 'anywhere' telephony, and real-time surveillance are a few key take-aways for users. F-Secure Corporation (formerly Data Fellows) is a Finnish cyber security and privacy company based in Helsinki, Finland. The company has 20 country offices and a presence in more than 100 countries, with Security Lab operations in Helsinki, Finland and in Kuala Lumpur, Malaysia. Through more than 200 operator partners globally, millions of broadband customer use F-Secure services. With Radar Managed Services vulnerability scanning and Rapid Detection Service as flagship products, the company continues to expand into the corporate market with enterprise-grade offerings. F-Secure Corp. is publicly traded on the Helsinki Stock Exchange under the symbol FSC1V.